The film opens with a prologue set in Transylvania in 1804, in which a Chinese vampire, Kah, resurrects Count Dracula and begs him to help restore the power of his undead cult in his region of China. 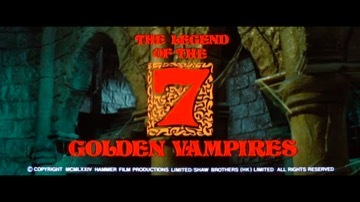 Dracula responds by taking over the body of Kah and, in his new form, he sets off to take control himself. The action then moves forward to 1904 and to Chung King, where Dracula now holds the inhabitants of a remote village in a grip of terror. Van Helsing, lecturing in China, hears of the presence of his old enemy and, with the help of a wealthy widow and a family of martial arts experts, decides to confront him again…..
With the popularity in the West of the Bruce Lee films and the television series “Kung Fu”, starring David Carradine, a tie-in with Hong Kong’s most successful film maker Run Run Shaw must have seemed a perfect combination to Michael Carreras. Unfortunately, however, it proved otherwise and cinemagoers, now being weaned on the more sophisticated delights of films like “The Exorcist”, stayed away in droves! There was no way that Hammer would be able to persuade Christopher Lee to don the black cape in this one, so the role of Dracula passed to John Forbes- Robertson, who had played the mysterious Man in Black in “The Vampire Lovers” (1970).